Built by Consolidated in San Diego. Constructors Number 164. Purchased by Qantas Empire Airways (QEA) and flown across the Pacific to Australia. On June 17, 1941 registered in Australia as VH-AFF. Assigned to the Royal Australian Air Force (RAAF). On July 27, 1941 assigned to 11 Squadron. On August 14, 1941 assigned to 20 Squadron. No known nickname or nose art. This Catalina was operating from Fairfax Harbor at Port Moresby. During the night of February 3, 1942, this Catalina piloted by F/L Hemsworth and co-pilot Sgt C W Miller on a night raid against Japanese shipping in Simpson Harbor off Rabaul. The formation included five Catalinas: this aircraft, A24-3, A24-18, A24-14, A24-17. Over the target, this Catalina was attacked by A5M4 Claudes of the Chitose Kōkūtai (operating in tandem with the searchlight crews) over the target, and damaged, possibly by FPO/1C Hiroyoshi Nishizawa and claimed a Catalina that night. All bombs were jettisoned and the aircraft attempted to gain cover of clouds. Both port and starboard fuel tanks were holed and a burst was received in the oil tank which severed an oil line. The aircraft escaped and proceeded to Salamaua where a forced landing was made at 1700Z/3. Repairs were attempted and the aircraft then departed on on one engine at 2341Z/3 and landed at Fairfax Harbor at 0700Z/4 the next day. On April 24, 1942 while moored off the Qantas Flying Boat Base at Fairfax Harbor off Port Moresby, this Catalina was strafed by A6M2 Zeros from the Tainan Kōkūtai and sunk. Postwar, the hulk of this PBY was visible south of the seaplane launch ramp. Until 1967, this Catalina remained in situ when the Australian Defense Force (ADF) divers placed charges on the wreck and demolished it, believing that it might contain mines. Afterwards, only smaller pieces remained including. In the late 1970s, diver Bob Halstead located a machine gun in the wreckage. In August 1978, the area was dredged, and remaining wreckage was removed or buried. 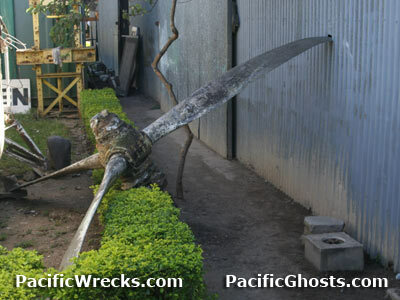 During dredging, one engine with its propeller attached was salvaged, and taken to the PNG War Museum, where it is displayed next to museum's indoor gallery entrance, and remains to this day.